A couple of days ago I apparently set off a firestorm regarding the current state of Wolfman Mac’s Chiller Drive-in. While I can see the first portion of my post appearing a bit dismal, my intention was to be positive and motivate my favorite werewolf, not to cause him stress. Unfortunately, some readers were under the impression that I was lamenting the end of his show. For the record, Wolfman Mac’s Chiller Drive-in is still being shown via RTV in 38 different markets throughout the country. Yes, the channel lost ground to MeTV but was NOT obliterated and Mac has NOT retired his character. I certainly apologize if I gave the wrong impression or caused anyone at The Chiller Drive-in undue stress due to reader’s reactions. Regardless of these misconceptions, I believe if you read the post you will see where I was coming from. I’ve received a bunch of emails and Facebook messages asking about the production, so I thought I’d just write a quick note. Wolfman Mac’s Chiller Drive-In is very much alive and well. We’re in a long hiatus. Longer than any of us want, but just a hiatus. We have every intention on creating MANY more episodes/seasons. I personally hope to be Wolfman Mac for years and years. That being said, I need to turn this production into a business before we do anything else. I am grateful for my cast and crew. I’ve had people build sets for us, write scripts, edit the show, act, etc….There’s been so much sacrifice from everyone involved. This may shock some of you, but this production has not made a dime. Now it’s time to figure out a way to become a real, profitable business. My goal is to be able to fairly compensate the people involved in my production moving forward. We can and we will, I’m very determined to manifest that. It’s a lot of very hard work and might take some time. We’re learning as we go along, making mistakes along they way, but we’re getting there. We have a great production with great potential, it’s time for us to make it happen before making new shows. We created a LOT with noth ing, we can create more as prosperous artists. As far as Retro Television goes, we have a GREAT relationship with them. Affiliates come and go, I can’t control that, I wish I could. But RTV is very much on the air, serving almost 80 markets, which is quite a lot. We’re grateful to RTV for a great opportunity. I say the same for the folks with the Monster Channel where you can watch us every Monday night at 8pm. I’m also working on expanding our reach. TV as we knew it growing up, has changed forever. How we watch tv and how programming is distributed has changed dramatically in the 5 short years that we’ve been in production. It’s very very rare that a network or TV station will actually PAY for content such as ours. For the most part, TV is now “pay to play.” Here in Detroit, for example, local TV stations are happy to take my content and air it. BUT, I have to pay THEM almost $3,000 per week as if our show was an infomercial. That’s just the business model now. It’s like that in a LOT of areas. Your local TV station does NOT care about LOCAL tv, they care about money. If you have a widget to sell and can pay a couple grand for air time, you are on TV, no problem. I won’t do that. I don’t want to do any kind of “fundraising.” It just feels weird. I’d rather see us getting a sponsor that believes in our product. As far as not attending horrorhound or the other conventions last year; I simply couldn’t. That’s all. I remember that I JUST had my head shaved for St. Baldricks about a week before Horrorhound. I couldn’t be the Wolfman while bald, so I stayed home. That’s all. The other conventions fell on dates that I had already promised myself on. I plan on attending Horrorhound and several other conventions this year. We’re still in production and we have big plans. We’re just in hiatus while we figure out a way to become a real business. We are NOT giving up or going away. Thank you for the amazing show of support and faith in our production. It’s appreciated beyond what I can really express. 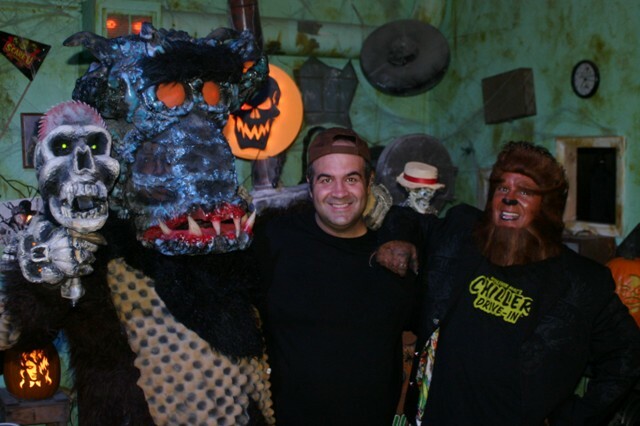 This entry was posted in Horror Hosts and tagged Wolfman Mac, WOLFMAN MAC'S CHILLER DRIVE-IN. Bookmark the permalink. ← It’s a Bird!…It’s a Plane!…It’s Sventa Claus! Very classy of you to post this Dave. thank you for posting this. I’ll tell ya one thing, you sure do have a LOT of readers!! LOL. I can totally see where you were going with it and I KNOW you were trying to HELP us. Thank you again, I appreciate you and our friendship. Looking forward to HH this year. After reading your last post, I too, got the impression that Wolfman Mac was Off The air! Miss you SO much in Boston on Saturday nights. We just don’t know what to with ourselves now!